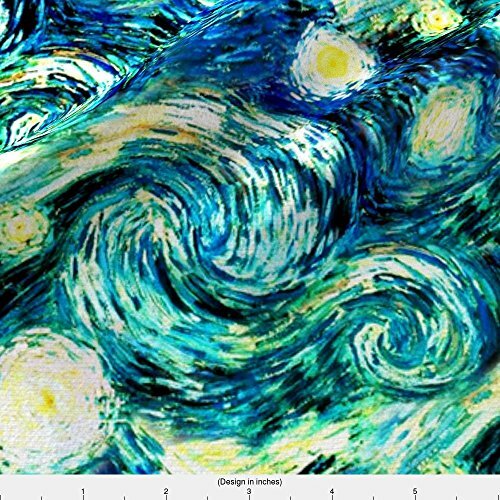 Starry Night Sky Swirly Stars from Van Gogh's Painting (sky only - large version) Designed By bohobear - Fabric Printed By Spoonflower On Basic Cotton Ultra Fabric By The Yard will be perfect for your next crafts or sewing project! This design will be digitally printed on demand onto the fabric type you choose from the drop down menu. Unfortunately, we do not offer half yards. *Please note, while we have done our best to accurately represent the color, colors can show up very differently on the computer screen as they do on printed fabric. * ::::You've selected Basic Cotton Ultra You've selected: Basic Cotton Ultra fabric --- Measures 42 in wide (107 cm). Lightweight 100% combed cotton fabric. Is appropriate for basic crafting projects, lining apparel and bags, home and wedding decor, and sometimes quilting. This design will be digitally printed onto the fabric type you choose from the drop down menu. :::: Copyright bohobear - You are permitted to sell items you make with this fabric, but we request you credit bohobear as the designer. You've selected: Basic Cotton Ultra fabric --- Measures 42 in wide (107 cm). Lightweight 100% combed cotton fabric. Is appropriate for basic crafting projects, lining apparel and bags, home and wedding decor, and sometimes quilting. This design will be digitally printed onto the fabric type you choose from the drop down menu. Each fabric type has a different width and is sold in 1 yard (36" or 91.4 cm) increments. Ordering multiple yards of the same design will result in one continuously printed piece of fabric. To see the scale of this design, please see additional product photos with rulers. Unlike conventional textile manufacturing, very little waste of fabric, ink, water or electricity is used. We print using eco-friendly, water-based inks on natural fiber textiles. No additional chemicals are used in the printing or preparation process. This type of printing has the added advantages of showing greater design detail than screen printing. Support Creatives. All of our designs are crafted by independent surface designers who receive a commission on every sale. By ordering from Spoonflower, you help an independent designer earn a living. If you have any questions about this product by Spoonflower, contact us by completing and submitting the form below. If you are looking for a specif part number, please include it with your message.